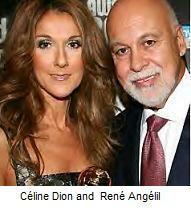 Stonewall Gazette: Celine Dion names one of her twin boys after Nelson Mandela! Celine Dion names one of her twin boys after Nelson Mandela! On Saturday (Oct 23) singing superstar, Celine Dion, 42, gave birth to fraternal twin boys at St. Mary's Medical Center in West Palm Beach, Florida. Picking names for the babies was a family affair. Celine's eldest son, René-Charles, 9, wanted his new brothers to have more Anglo sounding names while her mother wanted more traditional French. Céline and husband René Angélil decided that they will name the newborns Eddy and Nelson. According to People magazine the name Eddy comes from Eddy Marnay, the man who produced the singer's first five records and was like a father to her. The name Nelson is in honour of Nelson Mandela. While on tour in South Africa two years ago Celine met Mandela and was greatly inspired by him.